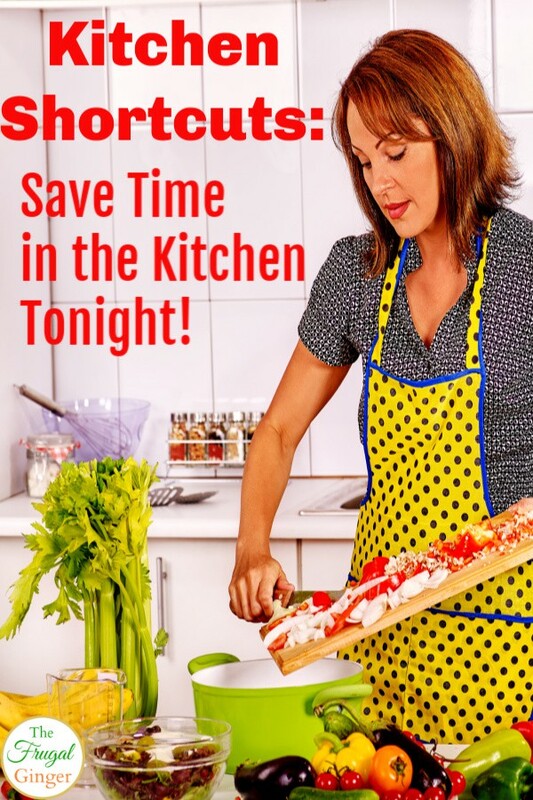 You are here: Home / Lifestyle / Life Hacks / Kitchen Shortcuts: Spend Less Time in the Kitchen Tonight! I love learning about all of the different time saving hacks and kitchen shortcuts that people use to get dinner on the table fast. It seems like there is never enough time in the day so these come in handy all of the time. I wanted to make a list of my personal favorite kitchen shortcuts that I use when I am cooking or baking. 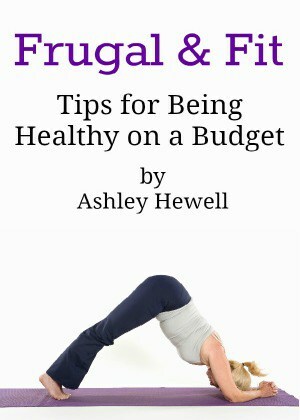 As a busy mom, I get how stressful it can be to get a healthy and delicious meal on the table. Hopefully these tips will help you shed precious minutes off of your prep and cooking time as well. If you need to shred some chicken for tacos, soups, casseroles, etc. use your stand mixer. Just put the warm chicken (not cold) in the stand mixer. Use the paddle attachment and mix on medium for about 30 seconds. You will then have perfectly shredded chicken. If you forgot to get out the butter to come to room temperature before you started baking, don’t worry! You can grate the amount of butter you need with a cheese grater and it will become softer faster. Most people will wash their fruits and vegetables before they cut them but you can save time by cutting the product first. You will then be able to clean the inner parts and the exterior all at once so you don’t have to double wash. The smaller foods are cut, the faster they will cook. When you take the time to cut smaller pieces, this will speed up the roasting and sauteing time. Not only do you spend extra time when you need to brown meat before you put it in the slow cooker, but you dirty another pan! To get the same flavor, add a little bit of soy sauce and tomato paste to the that meaty depth of flavor. I love this kitchen shortcut! I hate peeling garlic! The skin is never easy to peel off and my hands always end up smelling like garlic. If you need to peel a large amount of garlic at once, place the entire head in the microwave and heat for 20 seconds. Let cool for another 20 seconds and it should peel much easier. It can be difficult (and dangerous) to chop up fresh herbs. You can get the job done a lot faster by using a pizza wheel. 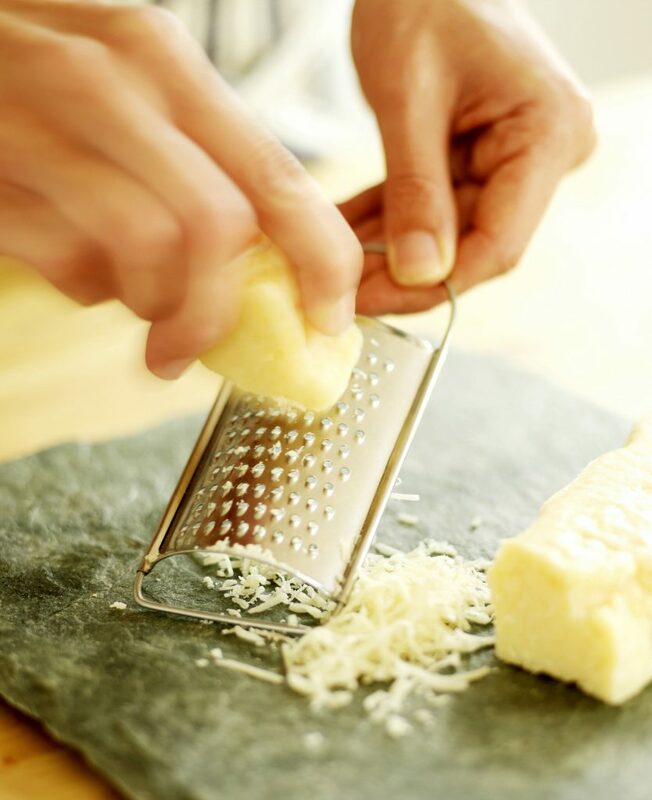 Grating cheese can be a headache if you don’t grate them at the right temperature. Grate Parmesan at room temperature for faster results. Freeze mozzarella before grating. Another kitchen shortcut for decreasing cooking time is to pound out your meat to make it thinner. This is an option you can do if you don’t have time to cut them into small pieces. To keep the mess to a minimum, place the meat in between 2 pieces of plastic wrap and then pound away. Clean a blender without even having to use a sponge. Fill your blender a third of the way with warm water and add a few drops of dish soap. Run the blender for 20 seconds and then rinse out. If you clean as you go, you won’t have to spend as much time doing dishes after the meal. As you are cooking, fill up your sink with warm, soapy water and place items in it as you finish with them to let them soak. While you are waiting for things to cook, you can rinse them off and place them in the dishwasher. We all know that Meal Prep is an important kitchen shortcut but it can be difficult to find the time to sit and actually do it. Services like eMeals will send you a complete meal plan from a variety of categories like: kid friendly, vegan, gluten free, clean eating, etc. They can even have the groceries delivered to you via Amazon, Walmart, or Kroger. You can grab a 14 day free trial to eMeals to see if it may help you save time in the kitchen. Other options are the home delivery services like Home Chef (get $30 off your first order) and Hello Fresh ( get $20 off each of your first 3 boxes). Not only do they cut out prep time all together but they also save you time by sending the groceries directly to you. Use the kitchen shortcuts that will work for you and your family. Let us know of any way you save time in the kitchen in the comments below. I’m always looking for new things to try!